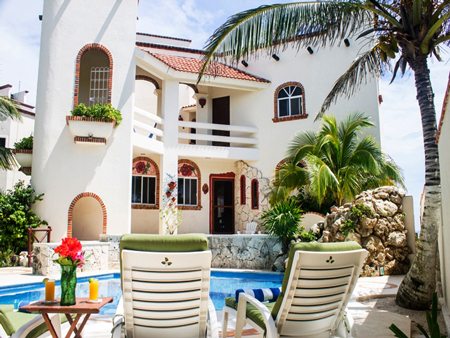 This Spanish “Hacienda style” oceanfront villa features a swimming pool, four air-conditioned bedrooms, and several exterior terraces, patios and decks. 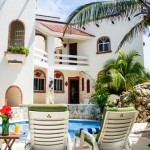 Villa Cascadas is conveniently located between Half Moon Bay and Akumal Bay, placing you in close proximity to shopping, beach bars, restaurants and activities. 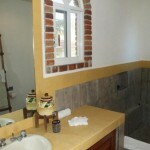 Cascadas’ design is pleasing to the eye with numerous brick arches and custom-made brick accents. 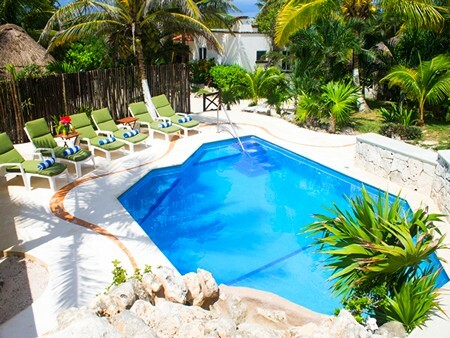 The swimming pool will greet you right in front of the house with its cascading waterfall and several chaise lounges for tanning. 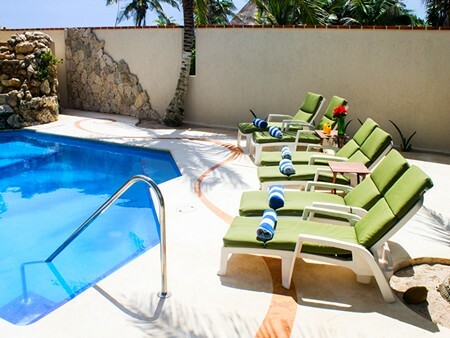 The pool deck has a charcoal grilling area perfect for cookouts by the pool, and with the villa blocking most of the sea breezes; your plate won’t fly away before you put your food on it! 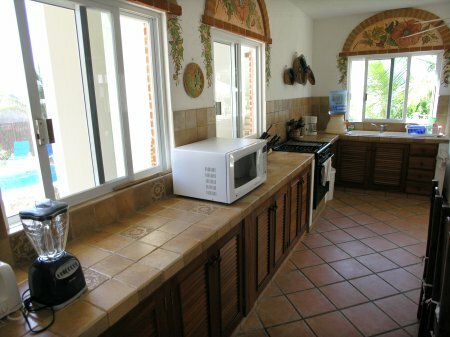 Inside, on the lower level, is a spacious, well-equipped kitchen, with lots of counter space and a dining table, which is very convenient for snacks and impromptu meals. 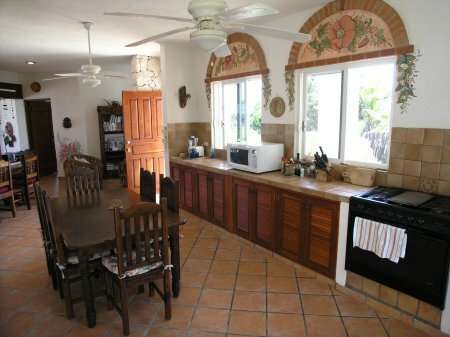 Another, more formal dining area, is between the kitchen and living room. 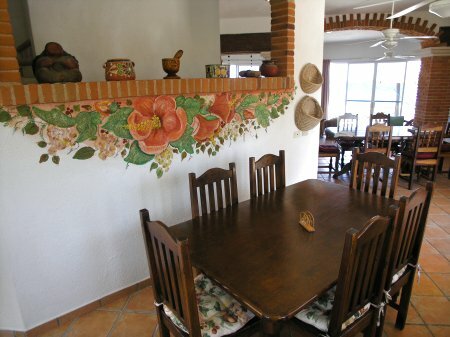 Each dining area seats six. 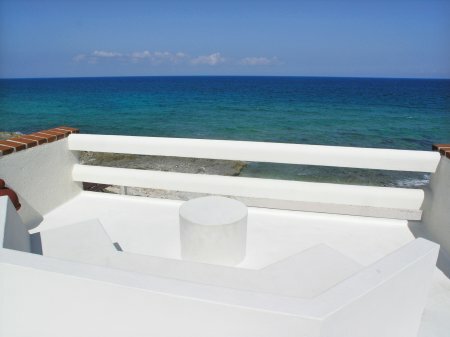 The living space is two steps down from the central dining area and with two sliders, there’s plenty of glass to enjoy the ocean view. 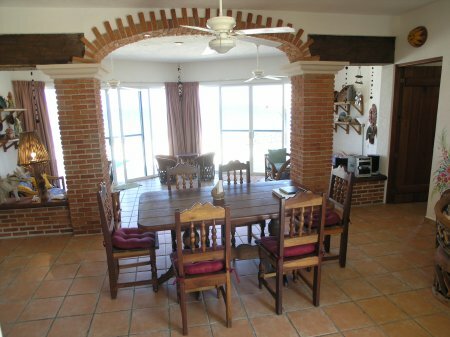 Off to one side of the living room, the entertainment area has satellite TV, and a DVD player with a selection of family movies. 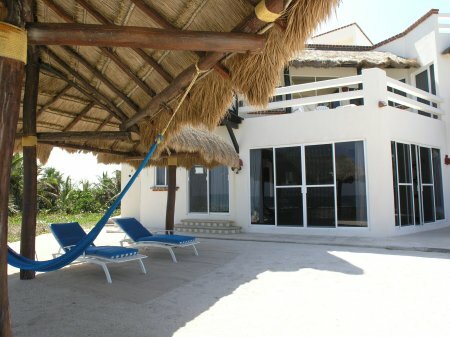 The ocean side patio has a generously sized shade palapa with hammocks and chaise lounges, and on the opposite side is another, smaller palapa, jutting right up through the tiled table, making for comfortable, shaded seaside dining. 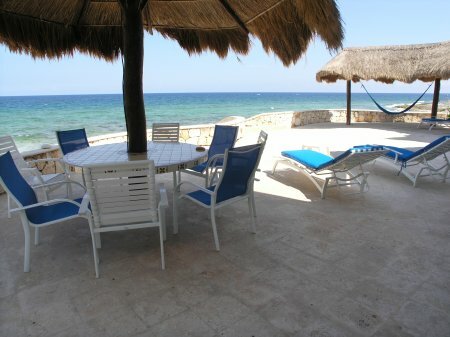 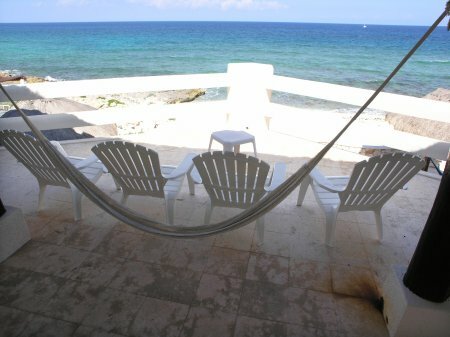 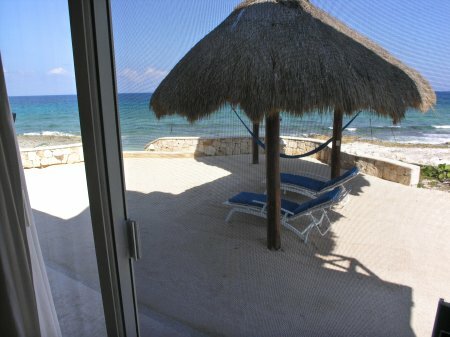 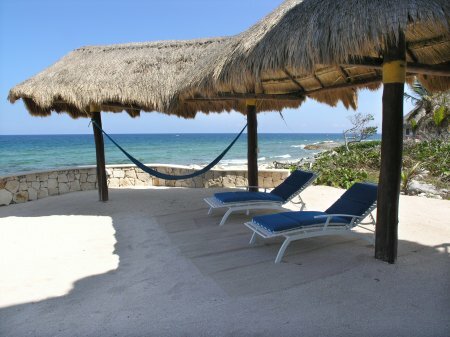 Sharing a meal on the patio or catching a siesta in a hammock under the palapa will likely become a daily ritual. 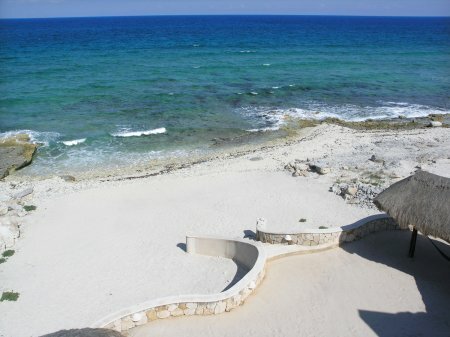 A stairway leads from the ocean patio down to the surf line, where a sandy tanning area faces the sea and provides sea entry when the ocean is calm. 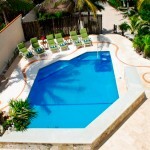 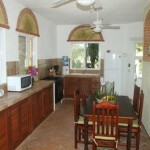 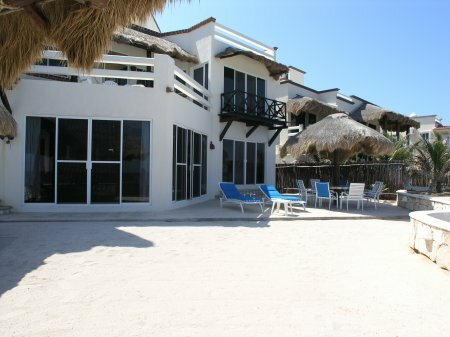 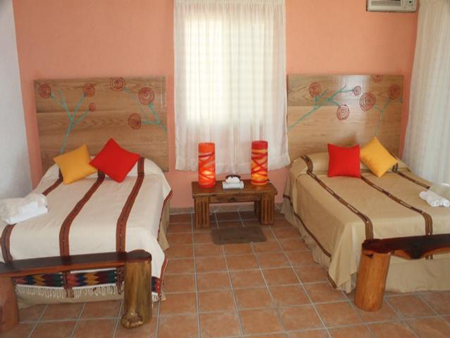 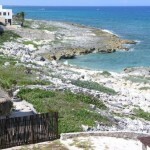 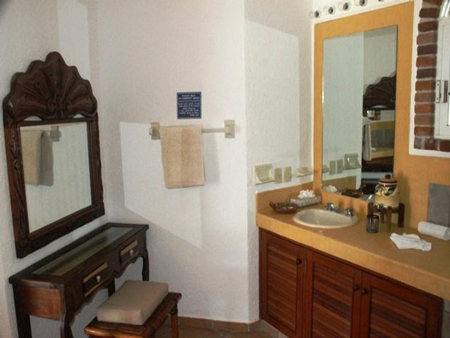 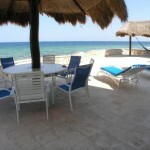 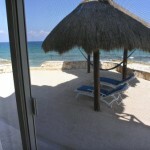 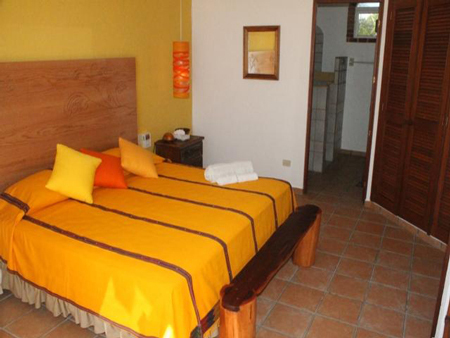 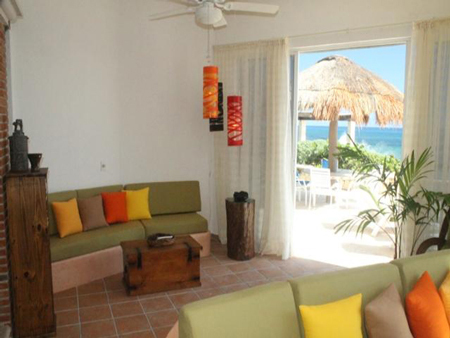 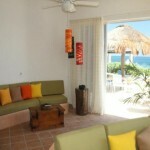 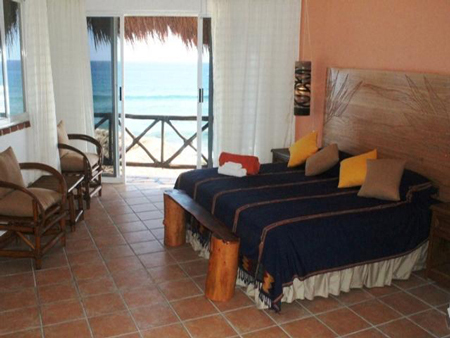 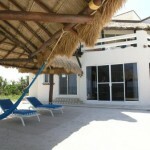 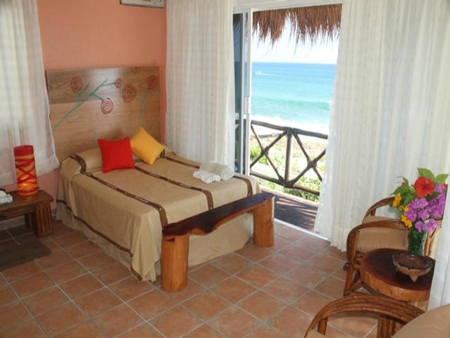 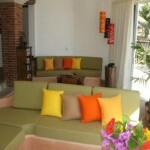 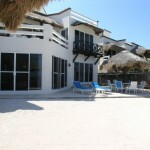 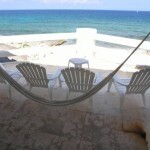 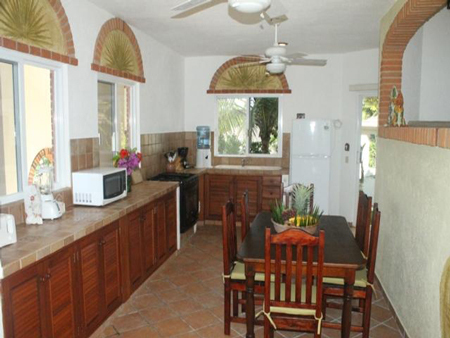 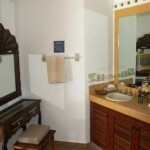 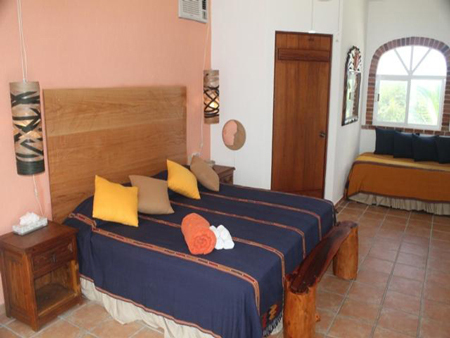 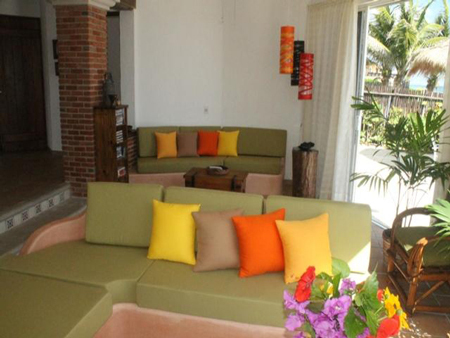 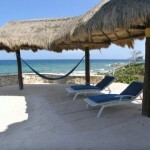 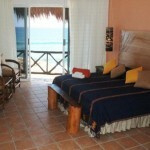 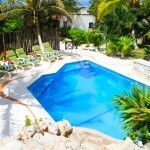 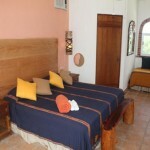 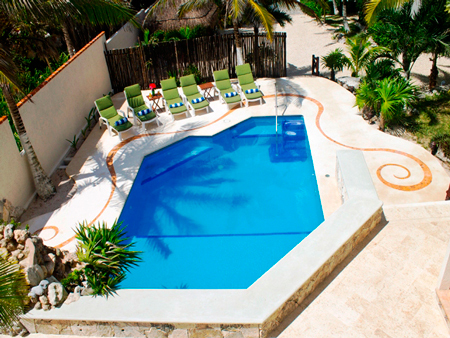 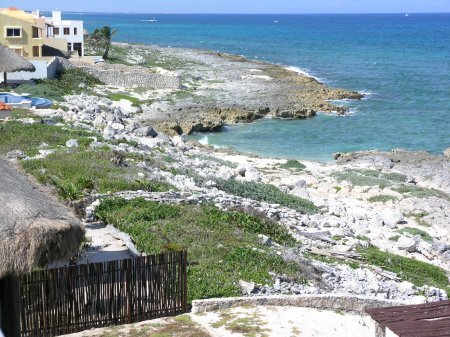 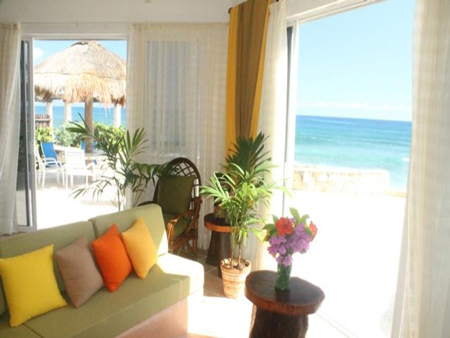 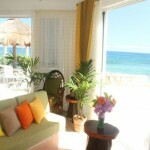 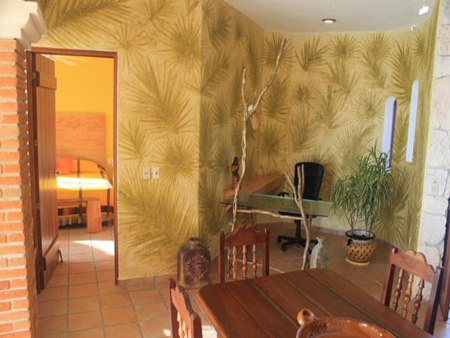 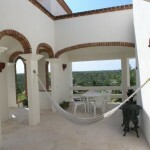 Cascadas has two bedrooms on the lower level, each with 1 king size bed and a slider to the ocean side patio. 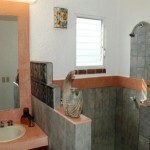 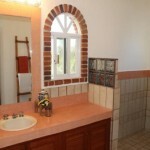 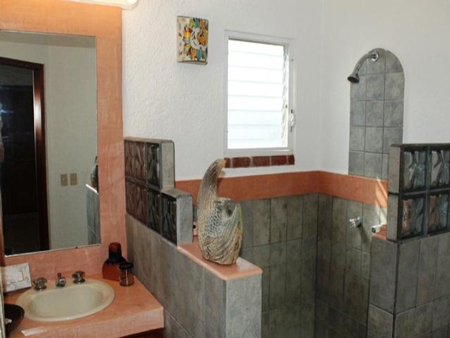 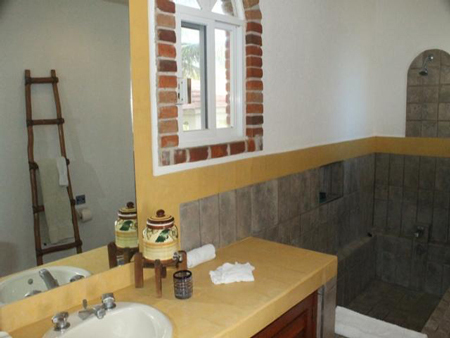 Both have private bathrooms with a shower, one also has a tiled bathtub for soaking. 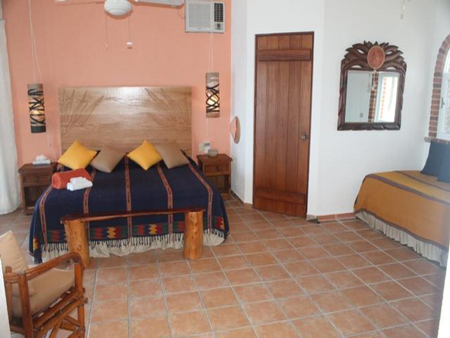 Upstairs, the master bedroom has a king size bed, sitting area, private ocean balcony and a private bathroom. 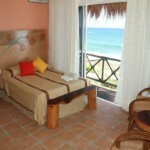 The upper level guest bedroom has one double and one singe bed, ocean view balcony and a private bathroom. 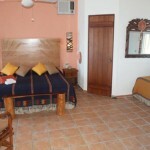 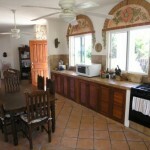 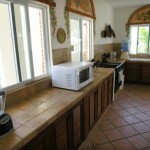 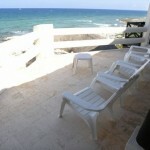 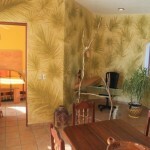 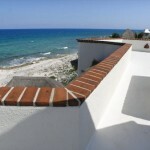 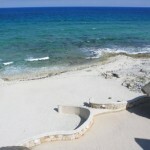 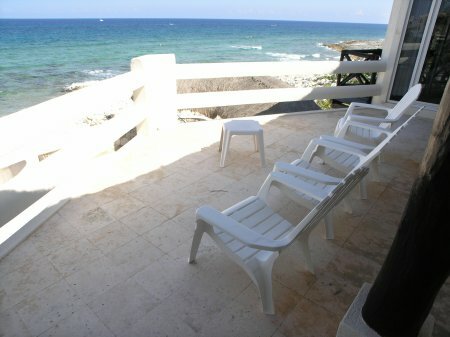 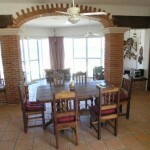 All bedrooms are air-conditioned and have a seaside balcony or patio. 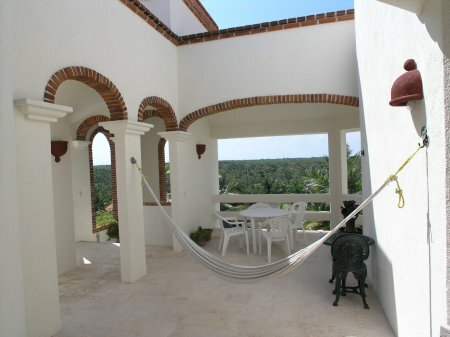 The second floor also boasts a jungle side; open-air terrace with a table, chairs and a hammock, and on the Caribbean side is another open-air terrace with a table, chairs with striking, panoramic sea views. 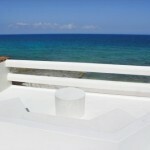 The rooftop observation deck has built in seating with a table, serving up outstanding views of the Caribbean. 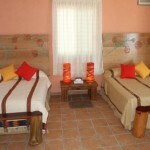 On a clear night, you’re almost guaranteed to see shooting stars and sometimes, you can even see the Milky Way! 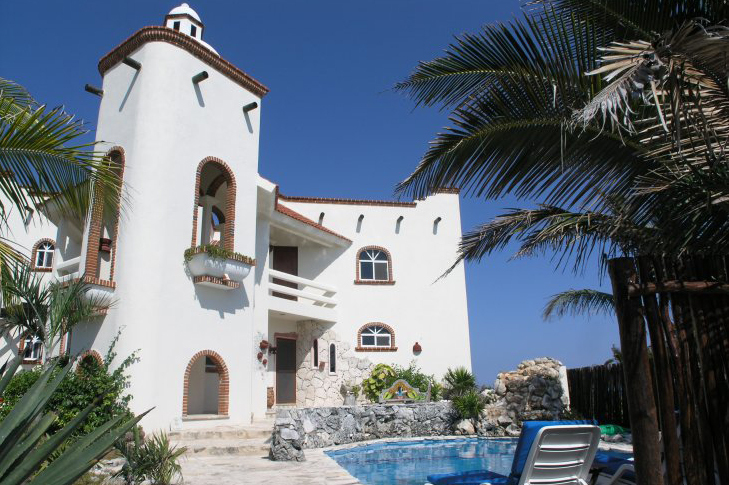 This villa is perfect for larger groups and families that want air conditioning, a pool and plenty of space to gather, and at the same time, would like to have a space to retreat to. 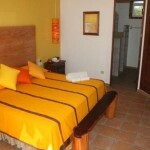 Cascadas has it all! 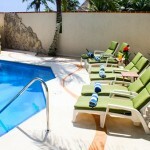 Add $250 USD per extra person ($150 USD for children 9 and under) over base 8 persons *. 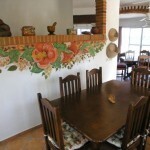 * Holiday Cook Service: $1,100.00 US/6 days, two meals per day, for up to 10 people. 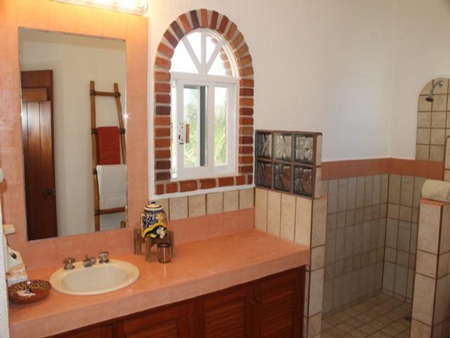 Gratuity is not included.